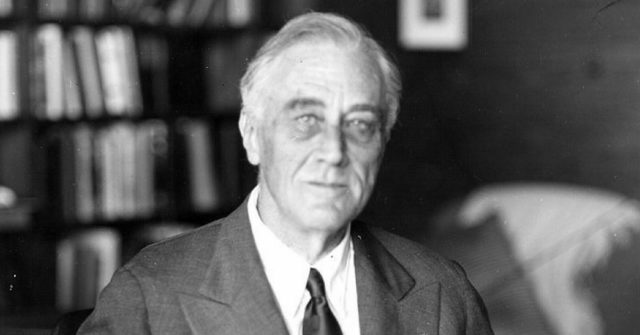 Last photograph of Roosevelt, taken the day before his death (April 11, 1945). FDR Presidential Library & Museum - CC BY 2.0. Franklin D. Roosevelt led the United States through World War II and the Great Depression. He was the only President of the United States to be elected to the office of president four times. He was born in 1882 on the 30th of January, in Hyde Park, New York. In 1921 was diagnosed with Polio, and he struggled with ill health for much of his life. When he was elected in 1933, he was the 32nd President of the United States. He is credited with expanding the powers of the Federal government through reforms and programs known as the “New Deal”. Franklin Delano Roosevelt was born into a wealthy family, who made their fortune in trade and real estate. Franklin was an only child. He grew up in Springwood, on his family’s estate in the Hudson Valley, in New York state. His was a privileged background, and he was well-educated by tutors and by his own governess. The whole large household, led by his mother, Sara, revolved around him. Sara Delano Roosevelt was a strong but fair woman. She was the leading figure in his life while he was growing up and they remained close. He attended the finest schools and had a different life from the common people he would later champion. He didn’t get along with other students and he didn’t excel at sports, but he still always strived to please others. After he graduated from high school, Roosevelt went to Harvard University and was determined to become someone important. He received his degree in 3 years, but his overall performance as a student was regarded to be average. He was engaged to his 5th cousin Eleanor Roosevelt during his final year at Harvard and married her on the 17th March 1905. 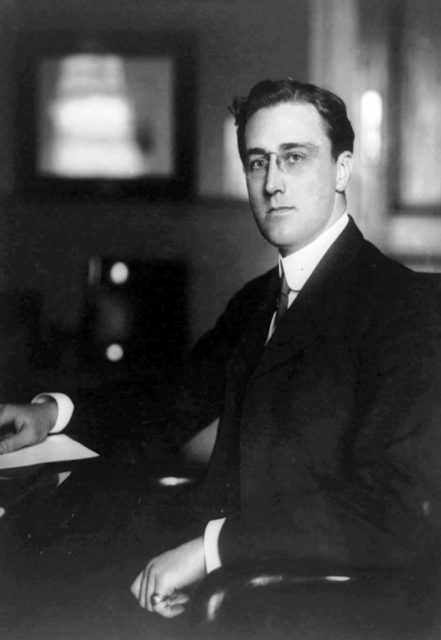 Roosevelt as Assistant Secretary of the Navy, 1913. After graduating from Harvard, Franklin studied law at Columbia University Law School and passed his bar exam in 1907, but he didn’t get a degree. He to New York and got a good job with a well-known law firm, where he worked for a few years, living well. However, he quickly got bored of law practice and the comfortable life – he had his sights set on bigger accomplishments. Roosevelt was invited to run for the New York state senate in 1910 when he was 28 years old. He was running as a Democrat in a district which had elected Republicans for the past 32 years, yet he managed to win the election in a landslide victory. He became a state senator and began opposing some elements of the Democratic Party, which led to many party members becoming disgruntled with him, but he was gaining national fame and popularity as a result. 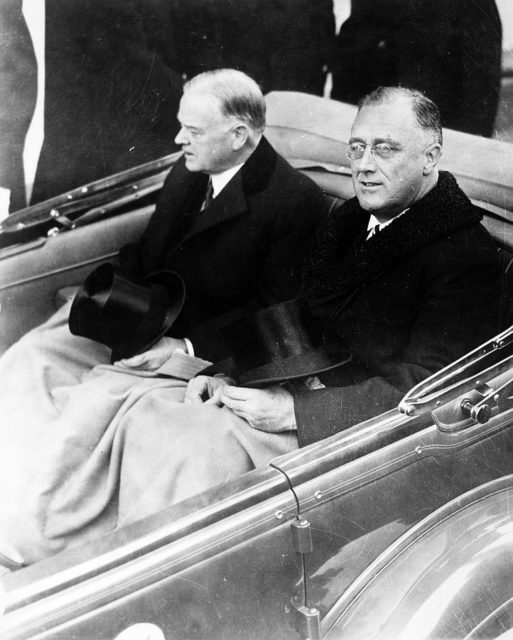 Outgoing president Herbert Hoover and Roosevelt on Inauguration Day, 1933. He joined forces with campaign manager Louis Howe, who helped shape his political career for the next quarter of a century. Franklin specialized in handling business operations and worked with Congress in order to modernize the systems and budgets of businesses. He actually founded the U.S. Naval Reserve but soon became restless with his position, as he was ‘ the ‘second chair’ to his boss. Roosevelt never let polio defeat him or end his political career. 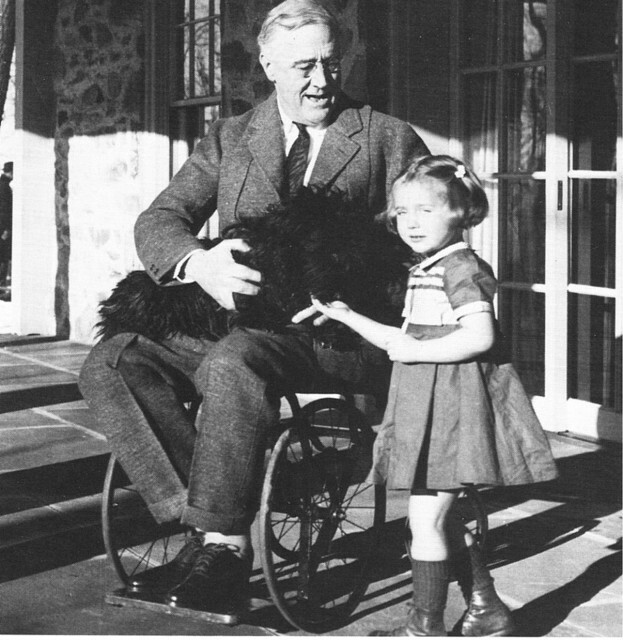 Franklin D. Roosevelt was diagnosed with polio while he was on vacation in Canada, and he refused to accept that he would be permanently paralyzed. He undertook all kinds of therapy, but despite all of his efforts he was never able to use his legs again. He established a foundation known as Warm Springs to help others suffering from Polio. Franklin believed that his political career was over, after he had been diagnosed with polio, and was resigned to his disease, but Louis Howe wouldn’t let him give up on his career. He encouraged him to work out and improve his political and physical image. Franklin learned to walk short distances in braces so that he could be seen in public without a wheelchair. Franklin D. Roosevelt became the 32nd President of the United States. 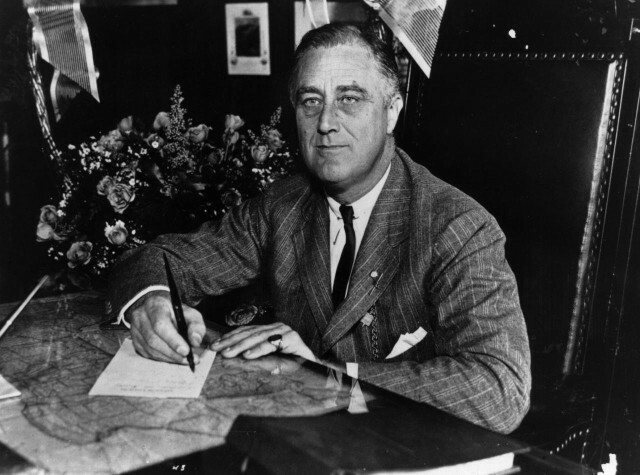 In 1928, Franklin Roosevelt was elected as the governor of New York, and he started numerous social programs because he believed in a progressive government. In 1930, the Republicans were being blamed for the Great Depression, and Roosevelt took his opportunity. He ran for President and called on the government to provide economic relief to the public. The people loved his positive and upbeat approach, and he was able to defeat his Republican rival Herbert Hoover to become President. At the time that Roosevelt took office, the economy was at rock bottom. There were more than 13 million Americans out of work. Hundreds of banks had been closed. Roosevelt was faced with the greatest crisis in the history of America since the Civil War. He introduced a sweeping economic reform legislation known as the “New Deal”, and temporarily closed all banks to stop withdrawals being made. He created a “Brain Trust” consisting of economic advisors who would create alphabet agencies like AAA (Agricultural Adjustment Administration) for supporting farm prices, CCC (Civilian Conservation Corps) for employing young men, and the NRA (National Recovery Administration), which would regulate prices and wages. He had improved the economy considerably by 1936, and the GNP was up by 34% while the unemployed had decreased from 25% to 14%. However, he was criticized for increasing government spending and causing budgets to be unbalanced. The U.S. Supreme Court declared several New Deal acts to be unconstitutional, which were met with Roosevelt proposing to introduce justices in court that would accept his reforms. America had remained isolated from foreign affairs after World War I and in the 1930s the Neutrality Acts had been passed by Congress to stop the U.S. from getting into foreign conflicts. However, Roosevelt stepped away from that act, and actively sought to help out friendly countries in military conflicts in Europe and Asia. 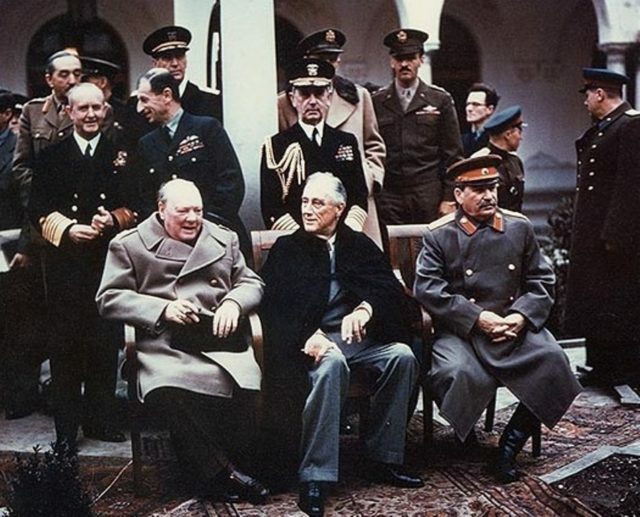 Churchill, Roosevelt, and Stalin at Yalta, two months before Roosevelt’s death. Roosevelt hadn’t announced that he would run for a 3rd time as president, but with Germany getting victories in Europe and Japan growing dominant in Asia, he felt that he was the only person capable enough to lead America through this difficult time. At the Democratic National Convention, he swept aside all his rivals and came out with the nomination as he won the Presidential election. He made sure that the factories of the United States became an “arsenal of democracy” for his allies, which included France and Britain. Roosevelt stood strong against the Axis Powers of Germany, Japan, and Italy, and expanded the Navy and Army. His hopes of keeping the United States out of the war were ended by the attack on Pearl Harbor on 7th of December in 1941. Franklin Roosevelt served as Commander in Chief during WWII and worked closely with Churchill and his other allies to devise a strategy to defeat Germany. Campaigns were launched in 1942 in North Africa, then in Sicily and Italy in 1943, then Operation Overlord, which began with D-Day landings at Normandy in 1944. Franklin D. Roosevelt was involved in the formation and foundation of the United Nations. On March 29, 1945, Roosevelt went to the Little White House at Warm Springs, Georgia, to rest before his anticipated appearance at the UN founding conference. On the afternoon of April 12, Roosevelt said, “I have a terrific pain in the back of my head.” He then slumped forward in his chair, unconscious, and was carried into his bedroom. Last photograph of Roosevelt, taken the day before his death (April 11, 1945). FDR Presidential Library & Museum – CC BY 2.0. After Roosevelt’s death, an editorial by The New York Times declared, “Men will thank God on their knees a hundred years from now that Franklin D. Roosevelt was in the White House”.